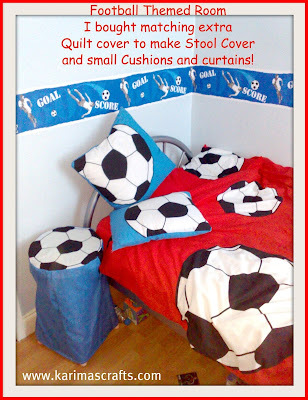 My son wanted his bedroom decorated in a football theme. I didn’t need to change the wallpaper as it was quite a neutral colour scheme. I did however, need to change the border. Because I had to cover the original border, I had to find a football border that was extra wide. Eventually I found one on an online store. I also managed to find a football lightshade (from B&Q) to go with the theme. Then the sewing part of my task was required. I managed to find a suitable quilt cover but didn’t find any reasonable curtains to match. The photo above shows the red quilt cover, the blue stool cover and the blue cushion covers. You can also see the border. Then the sewing part of my task was required. I managed to find a suitable quilt cover (choice of red or blue) but didn’t find any suitable curtains to match. 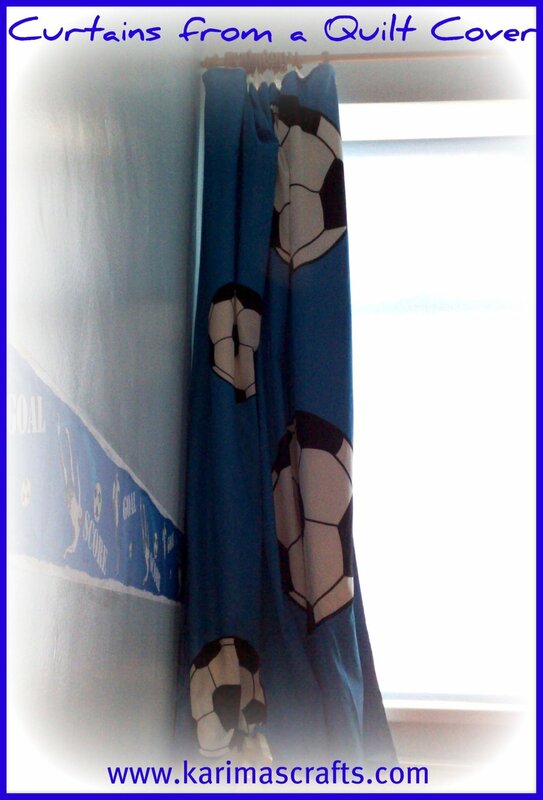 I decided to buy an extra quilt cover (blue) and turn this into a curtain (only one curtain, was needed as the window was narrow). There was plenty of material left over for other projects. I added some blackout lining to the curtains, which helped with strengthening, as the quilt cover material was quite thin. From the remnants, I also made a padded stool cover and a couple of cushion covers to help make his room all co-ordinated . I also bought a football lightshade to finish of the room. 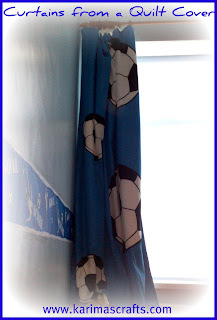 Above is a photo of the curtain I made.